Alessandro has been working for some weeks at the Avio Aero plant in Brindisi, where he started his third rotating assignment in OMLP (the Operations Management Leadership Program)... this time in the role of supervisor in the Repair Centre of Excellence, the heart of the Avio Aero revision business, where simplification and the development of new digital solutions offer a signpost for future challenges. The OMLP program (one of GE's Leadership Programs) takes place within the company’s Global Supply Chain and aims to develop - in the young graduates participating in the program - the necessary skills to successfully face the challenges of the current and future industrial world. During this process, the OMLP participants play a technical engineering role, a material management role and a supervisor role. Over its two-year course, the OMLP offers an opportunity to follow training courses aimed at exploring how the Global Supply Chain works, and also the invaluable chance to get to know and collaborate with colleagues from all over the world. Alessandro, tell us when you first arrived in Avio Aero and with what role, and also what you are doing today. 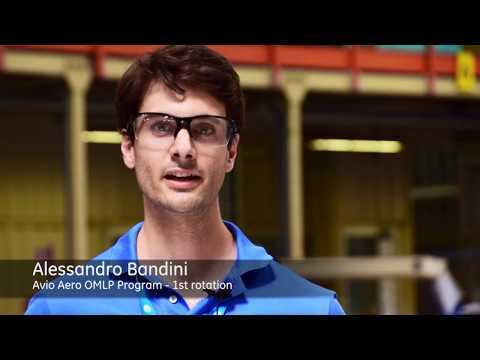 "I started my career in Avio Aero through the OMLP program, after working for about a year in GE between the BHGE business in Florence and GE Power in Milan. My aviation adventure began as Gears Production & Control Leader at the Rivalta plant. I had never previously worked inside a factory and this role faced me with a major challenge: the launch of a new engine, within a new development program. I had the opportunity of getting to know the processes in depth, and the product quality requirements, but above all to learn how important it is that all the different functions operate in a coordinated and efficient way. Currently, I'm doing my last rotation, this time as a supervisor in the Repair CoE in Brindisi, the heart of the revision business." What is the most stimulating and challenging aspect of the OMLP program? “The variety of the rotating experiences and their international nature are definitely the aspects that make this program so attractive. As I see it, the OMLP program represents an excellent opportunity to fully understand the productive reality in which Avio Aero operates, and also to contribute concretely, in one’s own small way, to the major challenges that GE has set itself for the coming years. Being part of the programme also means being willing to change, knowing how to adapt quickly to new situations and not to be afraid of obstacles. At the beginning of each new rotation, the OMLP must make the effort to leave their "comfort zone", say goodbye to their team and start again. In this way, we not only adapt quickly to change, we mature in directions that otherwise we might never have considered. These are qualities that I consider essential for success in the industrial world in which GE moves today." What lessons did you learn during your assignments, and what advice would you give to new recruits starting the OMLP program today? "My experience taught me how vitally useful it is to know how to listen, with humility and patience. In each assignment, I had to find the people who could start to teach me things. My advice would be to never stop learning: even when in difficulty or making mistakes, we must keep alive the desire for growth. But be sure also to move on to action! Learning in itself is not enough, you have to be ready to put yourself to the test and try to change things where opportunities for improvement exist." What added value does your personal and professional growth receive from being part of the OMLP program? "Being an OMLP means growing in various directions. Professionally, we add new roles to our cultural baggage and accumulate hard and soft skills that are certainly useful, but there’s more to it than that. During the program you have the chance to cultivate your leadership potential in many contexts. Voluntary work is certainly one of these. I am currently working on a wonderful project that will take me and sixteen other OMLPs from GE contexts worldwide to build a primary school in Nicaragua next October." A new "social solidarity" challenge: tell us more about this project. "My group of volunteers and I are collaborating with an international non-profit organization called 'BuildOn', with the goal of donating a school to the children of a small village in Nicaragua. The association is unusual: the mission it sets itself is to fight poverty through projects specifically aimed at promoting the education of the underprivileged. Nicaragua comes 124th in the world in terms of GDP and is also the least economically developed country in Central and South America: 15% of adults are illiterate and 29% of the population is employed in basic rural cultivation... This situation leaves very little chance for parents to build a better future for their children. We all know well how important education is, especially for children living in economically undeveloped areas which offer little or no opportunities to find a job. Personally, I think education is a crucial resource, offering the only possibility that these children have for building a better life for themselves and their families." How can we support and carry out this wonderful project with you? "It’s extremely easy to support this mission: we have built a web page where donating is much easier than buying a plane ticket! You just visit this link, Donate. In any case, the initiative does not confine itself only to fundraising. On my trip to Nicaragua, I’ll bring with me - in a virtual sense - anyone who wants to be a part of the project. For this purpose, I have created a Facebook page where I’ll keep a diary, in which I will tell the story of the village every day. For those who are unable to follow me on Facebook, there will also be updates on our Yammer platform... Anyone who believes in this initiative and wants to become part of it should know that even with a tiny donation you can give a lot to those who have nothing!" When you were a child, what did you want to do when you grew up? "To be honest... I'd like to say I always wanted to be an Engineer, or an aircraft pilot or maybe an astronaut, but that wouldn't be true... From a very young age, my favourite food was Neapolitan pizza. And I decided to be a pizza chef, so I could eat pizza all the time." Do you have a surprising aspect or passion that colleagues or acquaintances don’t know about? "Not many colleagues would know, but I adore cooking. Italian cuisine sets a standard of excellence for the rest of the world... but I’m also passionate about cooking in other cultures. When I travel, I always try to learn at least one new recipe. Among my most successful dishes I’d list tandoori chicken and Zurich-style stew!"